So I’m always talking about why SEO is ideal for driving targeted traffic to your website to produce leads and increase sales, but what if I told you there’s a much easier way to double your business before you start driving more traffic? Well, there is, and it’s no secret its just often overlooked by businesses, and digital marketers who tend to put too much importance on vanity metrics like the amount of traffic their site gets instead of attracting the right target audience who will ultimately convert at a much higher rate. You see by doubling your conversion rate with Conversion Rate Optimization you can grow your sales and reach your goals much faster than by increasing your traffic. Just think about all the ways, we drive traffic to our websites like SEO, paid search, social media, email marketing, or even print ads and just how much time and money, it will take to increase the traffic to a site. But instead, if you concentrated on improving your website conversion rates with the site traffic you already have you could make an immediate impact on your business. But How Do I Figure Out My Conversion Rate? Easy! You divide the total number of sales or leads by the total unique visitors to your website * 100. 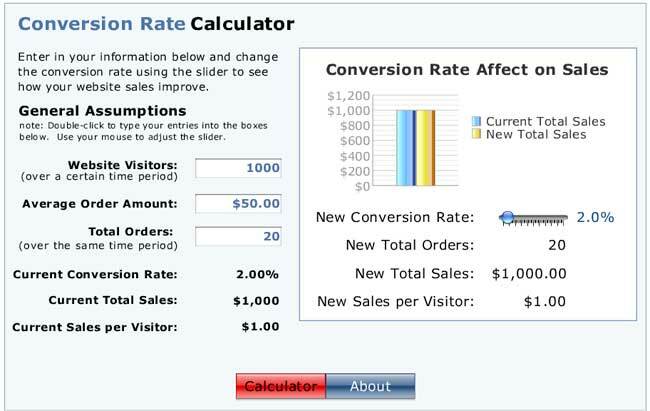 Example: 20 Sales / 1,000 unique website visits * 100 = 2.00% Conversion Rate. Once you know your conversion rate, it’s simple to project what changes to traffic or conversion rate will do for your total sales in the future. Website Traffic * Conversion Rate = Total Sales and if you want to take it further, you can multiply Total Sales * Your Average Sale Price to calculate how these changes will impact your potential revenue. It’s pretty clear the result will be identical regardless if you double your traffic or double your conversion rate. So What Do I Do After I Increase My Conversion Rate? Once you can increase your conversion rate, you can then focus on driving additional traffic, and guess what? That extra traffic will convert at a higher rate, and you will get way more ROI from your traffic investment if you focused on the conversion rate first. Make sure your offer is the right offer. Just because you have an offer doesn’t mean it’s the right offer. Make it compelling and make sure it resonates with your audience. Your offer needs to be easy to find on your page. Test Your Landing Page Design by making small changes and gauging their impact on your conversion over time. A/B or split test to make a direct comparison and refine your offer based on the data. Customers need guidance! Make sure to direct users with a well thought out message that ultimately leads them to a single call to action. Simplify the purchase or lead capture steps by removing unnecessary steps or form fields that result in customer confusion and disinterest. Offer free useful information in exchange for an email address so you can follow up and convert over a longer period. Use Remarketing, which helps you persuade indecisive visitors to go back to your site. Add a landing page popup, overlay or exit popup to present or ensure your offer won’t be missed. Make your phone number more prominent if calls are your goal. Applying these tips will help your landing pages deliver precise, high-quality information and a clear call to action, which will lead to a valuable increase in both Conversion Rate Optimization and overall visitor satisfaction. If you need help with your CRO strategy, please contact us today at 310-400-0561 for a free consultation!